Scotland are preparing for a "ferocious" World Cup contest against Japan, says head coach Vern Cotter. 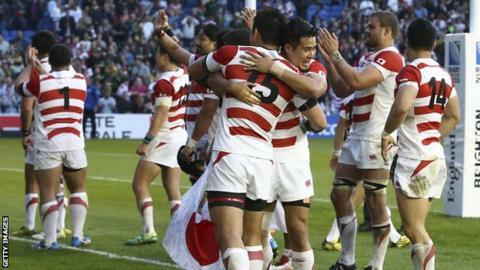 Japan shocked Pool B favourites South Africa on Saturday, winning 34-32 in Brighton with a stoppage-time try. "It gave us an additional focus because they didn't just compete - they won," said Cotter. "As coaches we didn't get much sleep after the game. "We expect them to be just as ferocious, just as driven and well-organised against us." Scotland have won all four of their previous meetings with Japan, the most recent clash ending 42-17 at Murrayfield in November 2013. But Japan have now leapfrogged the 12th-placed Scots in the official rankings after moving up to 11th. "The result confirmed a lot of what we thought about them," added Cotter. "I think everyone was impressed by their commitment. They got the result because they worked hard and with accuracy. "They identified a number of things and will have prepared for us too, so we know we'll be getting something well thought out. We need to stay focused and concentrate from start to finish." Grant Gilchrist thinks Pool B is now wide open after top seeds South Africa dropped points. Selected to play alongside Jonny Gray in the second row, the Edinburgh lock said: "We have always had a lot of respect for Japan. We've been looking at them for a long time and could always see they were a top side. "They showed that on Saturday and in terms of the group, it's blown it wide open. "It changes the dynamic of the group. Looking from the outside you'd have expected South Africa to have won their first two games before facing us. "But even the likes of Samoa, now that they have a win under their belt over the US, will be looking at South Africa and saying, 'We want to beat them as well'. "We want to qualify and while the Japan result doesn't change what we want to do, it does change the mindsets of the other teams who thought South Africa would roll over all their games." Scotland open their World Cup campaign against a side getting four days rest after their famous victory but Cotter thinks Japan will be in good shape. "I think everyone thought their energy levels would drop after an hour against South Africa but they didn't," said the New Zealander. "Assuming anything from this team is just dangerous. "The key is to stay switched on. "We are gearing up for a game that will be high in intensity and it will be important to play quickly and think quickly."